How Can CRS Notify and Fighting Chance Solutions Work Together? As the New Year rapidly approaches, new things are happening here at CRS. As you know, our goal is to give our clients the very best security options available. We have recently partnered with Fighting Chance Solutions in an effort to provide our clients more options for added security in addition to the CRS Notify holdup button software. To recap, CRS Notify equips businesses with holdup button software. Our holdup button software is installed on a computer. Each computer in a network can be connected, whether they are in close proximity or across the globe. In short, one campus of a business can know if another campus of a business has an emergency situation. Because CRS Notify holdup button software can also connect to E911, authorities will know the moment an alert is raised. This bypasses the alarm company altogether, saving seconds when they matter the most in an emergency. In comparison, Fighting Chance Solutions provides easy-to-use and effective security solutions that require no additional installation or permanent modification to doors. The Sleeve² and Rampart are currently being used in all 50 states in schools, places of worship, offices, hospitals and college campuses to add an additional layer of security to deter a hostile intruder or active shooter. The Sleeve² is a piece of hardware that slides over a door arm closer. The process is easy for anyone to learn. Because The Sleeve² slides on in seconds, valuable time is saved during an emergency. A classroom can be protected in a matter of seconds. On the flip side, if evacuation is necessary, the hardware slides off with ease. No permanent changes need to be made to the door in order to accommodate The Sleeve². The Rampart is a door bar that can be used at a moment’s notice. The Rampart is portable and can be used just about anywhere, commercial or residential. Because The Rampart is portable, it can be taken between doors and physical locations. 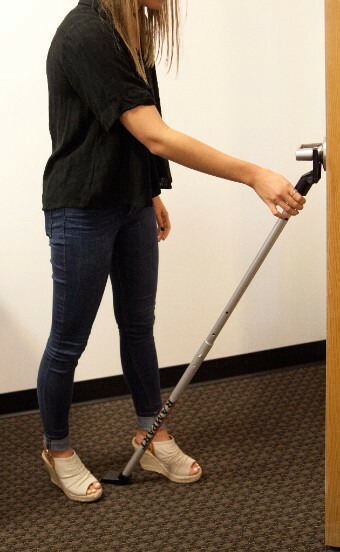 Just to name a few, The Rampart can be used in classrooms, offices, dorm rooms and even homes. No permanent changes need to be made to doors in order to use The Rampart to its fullest potential. How will the Collaboration between CRS Notify and Fighting Chance Solutions Help Me? Between CRS Notify and Fighting Chance Solutions, workplaces can be secured from active shooters. School violence, in particular, is on the forefront because the Sandy Hook tragedy just had an anniversary. Take, for instance, an active shooter situation in a school. At the first sign of danger, a teacher could raise a high alert within seconds. 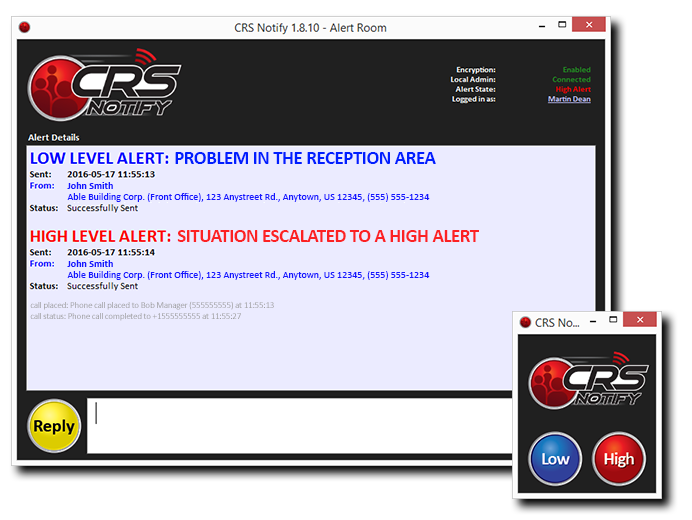 After the alert is raised, every computer outfitted with CRS Notify holdup button software will send an alert to their users. If the school has phone calls, texts or emails set up, then those alerts will go out as well. Simultaneously, authorities will be alerted via our E911 capability. Immediately after the initial alert was raised, every teacher could place The Sleeve² over the door closers in the schools and proceed with lockdown procedures. Think of how many tragedies could be avoided! Fighting Chance Solutions was founded by veteran educators in Iowa who hoped to help other teachers and students during an active shooter scenario. Along with CRS Notify, classrooms, offices and colleges, just to name a few, will be safe during an active shooter scenario. Between the door hardware from Fighting Chance Solutions and the holdup alarms from CRS Notify, time will be saved when seconds matter the most. Still Unsure About holdup button software? 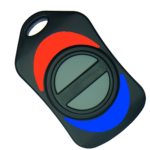 Contact us for more information to make the best decision for your holdup button software. Will My Vice Principal Know if I Activate a Panic Button in the Classroom? How Can an Under-Desk Panic Button Keep a Nursing Home Safe?